This is a sweet video Billie made of Harper laughing at me. She doesn't laugh a lot and gets very quiet whenever we pull the camera out, so this was amazing footage and Billie did a great job, too! There is nothing sweeter sounding than my children's laugh, Billie and Harper both have amazing giggles! You can't help but smile when you hear them laugh. God is so good and I feel so blessed this year. I would never have believed all that we would go through if you had told me last Christmas, even though I was on bed rest this time last year. It was a very difficult pregnancy, and an even more difficult delivery and recovery - especially for sweet little Harper Grace, but it was SO worth it. She has worked so hard to get to this point. It is just a miracle to see her sweet smiles and hear her amazing laughter. I don't know if life on Earth can get any better than this! Praise God from whom all blessings flow! Hello! Sorry it has been over a month since our last update. We have been so busy. Harper and I are getting into a better schedule/routine, though, and I am able to get more things accomplished. I enjoy her so much. She is such a good baby. She does rule the roost, but what baby doesn't? Billie always did, too. Harper doesn't really cry much at all, even when she is hungry. She doesn't like to be woke up so if a loud noise startles her or I have to put her in the car seat while she is still asleep, then she screams at me. She fights sleep, too, and will usually cry when I lay her down, or even if she is very sleepy and we are still holding her she will rub her eyes and cry. But it usually doesn't last more than 3 minutes and she is out. Except for during a meal, she doesn't fall asleep in our arms much anymore. She wants to lay in her bed and sleep on her own. Or stay up for hours on end! She naps her best in the morning, but does take several short naps in the afternoon. She has been sleeping through the night quite a bit, and usually wakes up only one time during the night. There are exceptions to all of this, of course, like the day she got her synagis shot. It is kind of like a flu shot, but intended to prevent RSV (Respiratory Syncytial Virus). I may have already blogged about this, but just to be sure everyone understands, RSV is a virus everyone can get, but in babies it is very dangerous and in preemies and those babies with lung problems, it can be deadly. If she were to get RSV she would more than likely be on the ventilator again, and she may not even survive it. The shot is given during RSV season and it is only good for 30 days, so she gets one a month for 5 months. The nurse said they are painful shots, and Harper agrees - she screams for 20 minutes at least after she gets it, and then is so fussy the rest of the day and night. It really hurts her feelings, and it breaks our hearts.When she gets normal boosters, she screams for about 1 to 3 minutes and then is fine. The shot doesn't necessarily keep her from getting RSV, but if she does get it, hopefully it will not be as bad of a case. But hopefully we can keep her from getting it all together by not having her around anyone. The thing with RSV is that you don't really know you have it as an older child or adult, it can just be a runny nose for you because you have the antibodies to fight it off. Harper doesn't have that ability. SO we will keep her isolated through RSV season, which means no Christmas parties for Harper. I do take her out some, but I keep her in her car seat covered up and I do not allow anyone to even look at her. If I hear someone sneeze or cough, I run the other way, too! I don't take her out much, though. Usually Matt or I stay home with her and the other goes where ever we need to go with Billie. Or we just don't go at all. We have taken her to church twice now, but we don't let anyone get close and go to the early service and sit in the section no on else sits in. It's so nice to go to church as a family again - I can't even explain it. I know Billie loves it, too. Enough rambling, sorry. But I know I didn't really understand all of the RSV stuff before I had babies. Christmas is bitter sweet, as I am sure it is for everyone. As we pulled out the decorations, so many of them brought back sweet memories of Michael and of Joshua and Caleb. There's always part of me that longs to be with each of them, and Christmas is always the hardest. We have ornaments that were Michael's as a child, and our "just married" ornaments that I love to put on the tree, but always shed a few tears as I pull them out. Billie loves to hang his fishing themed ornaments every year. It always leads into fun stories about her daddy, and Billie loves nothing more than a fun story! We also have ornaments that were purchased with the boys in mind. They never had a first Christmas, but we always felt we should include them in our Christmas traditions. They are still such a big part of our family and always on our hearts and minds. I always let my mind wonder a little bit about what they would be doing this year had they made it to this, their 4th Christmas. Then I try to picture them in heaven and I still fight with myself and my mind's picture of them in heaven. Are they conjoined or separated in heaven? People have strong opinions about this. Most people feel they are for sure separated and their reason is that heaven is perfect and we receive perfect, heavenly bodies when we arrive there. But the truth is that none of us actually know, we just try to interpret what we read in the bible. I am sure the answer is actually there, but since it is open to our interpretation, I won't feel like I really know until I see them again for myself. The thing is, while others may see them conjoined as not perfect, God doesn't make mistakes and they were not a mistake. They were perfectly made by God. They were so beautiful. I know there bodies were not made to survive here on Earth, but maybe they had exactly what they needed to be in heaven. Maybe their bodies were perfect for heaven. Maybe God had great things for them to do in heaven and they needed to be conjoined to do those great things. I know I have mentioned these thoughts in the blog before, but it just is fresh on my mind and good to get out. The same thing I say to myself about Michael to make myself feel better, that he is cured in heaven and has a new body with out cancer, is the thing that has me so perplexed about my boys in heaven. I don't know why I struggle so much with this. If I am honest, I would say it is guilt. Because part of me thinks if they had just separated on time in the womb, they would just be perfect identical boys and they would be here with us this Christmas. It is that part of me that still wishes that would have happened, even though I loved them so much just the way the were and I know it is selfish of me to wish it. I feel guilty for wishing they were here with me instead of with Jesus. I feel guilty for wishing they would not have been conjoined, because I know that was God's will and I got to witness such a wondrous outpouring of love around us because they were conjoined. I also feel guilty because if they had survived, I probably wouldn't have Harper today. I can not imaging my life without Harper! She is such a blessing, and such a miracle. All of this is just to say, I still struggle every day. I struggle with what I have and what I don't have. I miss Michael, and feel guilty for missing Michael because I am so loved and so blessed. I miss the boys and feel guilty for missing the boys, because I am so blessed with the two beautiful girls I do have. But I can tell you a person is not replaceable. One person does not replace another. Matt spent the other night compiling a list of addresses for me to help get the Christmas cards addressed with. While he was searching on his computer, he found pictures of Joshua and Caleb and couldn't stop himself from looking. Looking, wallowing, call it what you want, but it surprised him how hard it was still this many years later to look at the day they were born. The feelings are still there, you just push them way down inside and secure them there. Some days are easier than others, and you have more minutes or hours in between that you don't think about them, but they are always there. They say time heals all wounds, but I think the wounds are still there and we just find ways to put bandaids on them. Those bandaids get ripped off, sometimes when we least expect it, and it still hurts just as much. We learn to live with the heart ache. You don't ever stop loving. I walked into his office as he was looking, saw one picture and ran right back out, knowing I wasn't emotionally able to go there that night. Some days I want to and can handle it better than other days. I was already so emotional from the decorations and just with it being Christmas time, plus being sleep deprived and exhausted from taking care of Harper, I knew there was no way I could go there. Now our tree is decorated and the sweet ornaments that bring back memories are hung and are free to remind us. There are funny memories, like the ornament I affectionately refer to as "The Taj Mahal" which is Matt's and his grandma made it many years ago. Let's just say it's an attention getter from the 70's, and leave it at that! There is the adorable paper ornament with Billie's 5 year old smiling face on one side labeled "nice", and her pouty face on the other side labeled "Naughty!" We have lots of frogs on our tree, since Billie is a frog-maniac, and lots of Disney ornaments, since I am a Disney-maniac. There is no theme to our tree other than it represents our fun and crazy family. This year we will add some to it to represent Harper and Billie and this time in their lives'. Next year when we pull out the decorations, we will be fighting with a 20 month old toddler trying to pull everything down and put everything in her mouth! Maybe we will have to put a barrier between her and the tree to keep her from pulling it down on herself! I don't know what kind of a toddler she will be, but I kind of think she will give us a run for our money, just judging by the fight and determination God has clearly instilled in her - thus her surviving from such a teeny-tiny start! I have been mentally preparing myself for that. I keep telling myself, when she throws a fit when she is 2, or her first word is "NO!" I will have to just thank God and laugh because that is why I have her here with me to begin with! You all remind me of that if I need it though, Okay? Harper at the apnea/pulmonology office -- They weighed her in at 10 Pounds on the dot!! And just shy of 21 inches! Our girl is growing! I love this picture - her expression is so funny, almost a "snotty" look! How cute are these two? Best hat ever, too. It is so warm and it actually stays on her head! Billie checked out a book from her school library just to read to her sister. SO SWEET! So we put them in Christmas PJ's that night and snapped a few presh pics! OK, not a great pic of us - you try to hold a baby and take a picture of three girls with HUGE eyes that always blink! IT was so fun, I just had to include it. We laughed so hard doing this, even Harper was laughing. Not that you can really see it, but this was in front of our tree. This was Sunday after church, Harper's second time attending church. She was so quiet both times, and really enjoyed the music. Billie and Harper are so adorable together. Harper just lights up at Billie's face or voice. And Billie is just so in love with her little sister. I so enjoy watching her interact and even just listening to her talk to her sister in the car as we run errands or pick Billie up from school. Billie is so animated with Harper and knows just how to cheer her up or calm her fussiness. We are so blessed. At her 6 month old check up...such a big girl! My pirate and zebra...so cute and so sweet! Happy Halloween, a little late! Hope you all had a fun Halloween. We had a great one. Harper had physical therapy on Halloween, her first visit since her discharge from the hospital. Dr. Trainer taught us lots of "exercises" to do with her. It's mostly just playing and getting her to bring her arms in to mid-line. God has an amazing plan, always. Babies that are term are all squished and crowded in the womb at the end of the pregnancy so they naturally have their arms and shoulders brought to the front of their bodies so that eventually they are able to grasp items and stick them in their mouth - important skill for feeding themselves. Preemies are never crowded so their arms splay out to their sides and unless you work with them to get their arms in front of them, they are not able to self-sooth or grasp items, which would cause them to be delayed. So now we work with Harper three times a day plus during feedings to bring her shoulders in and to the front of her body, and her hands to the middle, too. We also got to see a former NICU-mate (totally made that term up, but I like it! ), Milly and her mommy, Jenny. They were also having their first appointment with Dr. Trainer. It was so good to see them, if only for a few minutes. 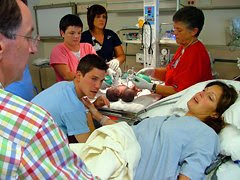 You really bond with the families that are going through similar situations as you are in the NICU. I have missed Jenny and Milly so much. I even got to hold Milly for a few minutes! She is just adorable. She is like the polar opposite of Harper, it is so funny! She is as blonde as can be and has the prettiest blonde complexion ever! Jenny teased that Harper will be getting a tan while Milly will be sitting under the biggest shade tree ever as they get bigger! And she is so big, over 11 pounds now! It's amazing the difference a few pounds makes in a baby. It was so good to see them. After we got home, I took Billie to Aunt Lique's to trick-or-treat with Mallory while Matt stayed behind with Harper and handed candy out to our trick-or-treaters. Billie had a good time, even if she didn't get a lot of candy. She got enough, though. We have a rule in our house, after two weeks, the candy left over from Halloween is trashed to make room for Thanksgiving and Christmas treats. There is still no way she will finish her bag before the two week deadline, even if she got about 1/4 of the candy she usually gets. Angelique had lots of food and treats for us all to enjoy and it was nice to just sit and visit with our family for a while. Meanwhile, poor Matt was dealing with a screaming baby pretty much the whole time we were gone. She doesn't get fussy every single day, but if she does you can pretty much bet it will be between the hours of 5 and 9 pm. Usually the only thing that finally calms her down is to nurse her, something Matt can do nothing about! By the time we got back, she had cried so hard she was passed out in his arms. All of her appointments have gone good the last two weeks. She is up to 8 pounds 7.5 ounces, and 20.5 inches long. She got her flu shot and her next round of boosters. Her eyes look good as far as the ROP, and she also saw Dr. Gitchlag to check her vision and he said her eyes look like a term baby of 2 months, which is her corrected age. Dr. Trainer, the PT, was pleased with her progress, too. She made me feel a lot better. I was concerned with the way Harper holds her arms and hands, but Dr. Trainer said she is just premature and her movements are just in relation to that. As far as her holding her thumbs in her fists all of the time, Dr. Trainer also thinks that will improve in the coming months and is not CP, which is what I was worried about. Only time will tell, but all in all, she is doing fantastic! I hate to end this so abruptly, but it is time to get Billie up for school. Hope you all have a great day and I will try to update again soon. Thanks for the love, support, and prayers! Wearing the SAME OUTFIT, 10 years later! Isn't that great?! I am so glad I saved the outfit I brought Billie home in. Billie was newborn and almost exactly the same size as Harper is at almost 6 months old. I just have a hard time wrapping my mind around that. Harper seems so big now, and her size is so normal to us, but she should really be much bigger. She is over 8 pounds now, I don't know exactly what she weighs because we haven't had to take her to the doctor this week! That's right, not one doctor visit this week, at all! Of course, we will make up for it next week when she has 5 different appointments, but it has been nice to give her a whole week off. She doesn't mind going to the doctor, really. It's not like they stick her every time, or give her shots every time. But this week she will have shots for her 6 month check up, plus a heal prick and she hates the eye doctor and she has to see the retina specialist and the pediatric optometrist this week. We also will see the apnea/synagis and she will get her first RSV vaccination soon and we visit the physical/occupational therapist this week, too. So, it is a busy week coming up and we have enjoyed the week off. All of these visits are really just routine, though, and just so that everyone can keep a watchful eye on our growing girl. She is doing excellent! As you can see from the picture, she may be the size of a newborn but she does not act like a newborn at all. She is very vocal now, laughing and cooing at us and at her mobile. She holds her head up so good, too. She has discovered her hands and loves to "chew" on them all of the time. She actually prefers her hands to the paci when she is awake. We are just so blessed. She is our little miracle. I looked back yesterday at pictures from the day she was born and was just awestruck at how far she has come. She is so strong and brave and I am humbled at what the Lord has done for her and for us. I can't imagine our family without her now, and I am so thankful for every minute of my life. I my have had some hard minutes, but they were worth it to get to this. Billie is doing great in school. I met with her teachers this week for parent/teacher conferences and they just love her and sing her praises. Her report card comes home today, but I already know she made second honors, and almost first! She was so close to straight A's! Maybe next time. She says that is her goal, to make straight A's, and she is so close. I know she can do it. She is a very good student and a very hard worker. I will keep you posted on that front as the year progresses. She loves her sister and is so sweet with Harper. Harper just adores Billie, too, of course. Billie is so caring and tender with her sister. I know I have said it before, but I would not have planned to have my girls 10 years apart, but it really has worked out just fine. I think they are growing closer every day and I think that will continue to the rest of their lives. I pray they are always close and special in each others lives. Harper is waking up, so I must go. I wanted to tell you about Harper "talking" to the picture of her brothers but that will have to wait until next time! I hope to get a video of it, so maybe that will be over the weekend while Matt is home to help me. I am so sorry it has been so long since my last post. I totally mean to blog every day, even "write" entries in my head as I try to fall asleep, pump, or pace the floors with Harper and somehow the day gets by me and no blog has actually been completed. So to make up for it, I included a sweet video of Harper talking to me. She is all smiles whenever she wakes up, and loves to stretch her vocal chords with sweet coos. Those smiles are the most rewarding and uplifting sights to my eyes, and the sounds are the sweetest to my ears. I just have to reflect on how far Harper has come since April 23! She was so tiny and sick when she was born, and look at her now! You have to see the amazing way the Lord works when you see her talk and smile. God is so good and has been so good to me. Yesterday when I picked Billie up from school we had to take something to Matt at work and the whole drive out there, which is about 25 minutes, she talked to Billie and smiled at her. It was the sweetest thing in the world to listen to my 10 year old talk baby talk to her sister. Billie has got to be the best big sister in the history of big sisters! She always puts Harper first - always, no questions asked, no whining, no complaining and even with a joyful heart! If I had not been driving I would have taken video of it to keep forever and to share with you, too. You will have to take my word for it, but it was a beautiful sight to behold. I would not have planned to have children ten years apart, but God is blessing me so much through this experience. Billie is so mature and amazing, but she doesn't try to mother Harper, either. We have all just put these new "hats" on in our family and they all fit superb and are so comfy, too. Billie just naturally loves her sister to pieces and appreciates the little strides Harper makes. Billie gets so excited to receive a smile or a coo from her sister, and she treasures every second she gets to spend with her, too. I just can't tell you how blessed I am to see my daughters together. They each are so strong and amazing, and the two together are just enough to make my heart completely burst with gladness. To get to the "ounce" part of my blog title, Harper is gaining weight! Yes, it may be ounces - but put every ounce together and they add up to POUNDS! 7 pounds, 6.5 ounces, to be exact! She is doing so great! She has really taken off on eating this week, too. Just last week, 40 mL (just over 1 ounce) was an average meal for her, and this week her smallest meal is 70 mL - almost double - and her big meal of the day is 95mL (over 3 ounces!) With that big jump she isn't spitting up, either. We no longer have to force feed this sweet baby, she gobbles it up all on her own. Dr. Greg said after she hit 7 pounds everything would get better and it sure has! Since he was so right about this, and everything else so far, too, when he tells me not to worry about her hernia or if she might have CP, I am going to listen to him. Harper has such an amazing team of doctors and nurses working for her future and watching over her, I am just trying to love her and nurture her and let all of them worry about the serious stuff. I say that and I mean that this morning, but I do admit that I may have moments of weakness in the future when I worry about some of it again. But "when I am weak, then I am strong," 2 Corinthians 12:10 is always on my mind and it helps me to remember God is perfect in my weakness and He has this. All of this. He always has and He always will. God is so good that He keeps giving me more chances, too! So back to how everything has gotten better, Harper is now sleeping so good. She is still in her pac 'n play, but that is fine with us. I still put her in her crib during the day to play and try to get more used to it. I think it is just still too big for her, she likes to be in a little cocoon all snug and safe. She sleeps 4 to 6 hours at night, and I think some nights she would sleep right on through if I let her, but until she is 8 pounds we will not be letting her go that long with out a meal. Usually she goes 4 hours for the first feeding and then back to 3 hours for the rest, but last night she went a full 6 hours! She usually goes right back to sleep after she eats, too. She has has a few bad nights sprinkled in there, too, where she just doesn't want to sleep and all she wants to do is eat. I have noticed that I can predict if she will have a fussy day by the kind of night she has. If she sleeps good at night, she has a great day with lots of long naps and she eats good, too. If she is up all night, she has a terrible day needing to be held all day and eating only small, frequent meals. She has started getting fussy every night for about an hour, usually between 5 pm and 9 pm. Sometimes it lasts up to three hours, but usually I can figure out something to fix it and it is always because she is over tired. I guess that is colic, right? Billie did the same thing and it resolved when she was three months old. Harper's corrected age is two months and she really seems like a two month old baby. The changes and strides she has made tells me she is going to be OK. I am sure she will "catch up" eventually and we will one day say "can you believe she was even a preemie?" Since she was born I have heard wonderful stories of other preemies that are now in college and are so smart and so successful and you would never know they were preemies. In fact, my own sweet cousin, Kelly Wells, is one of those preemies! I had no idea until Harper was born that Kelly was a preemie, either! Born around the same gestation as Harper, too. She spent 4 to 6 months in the NICU, and now she is a Crime Scene Investigator (CSI)! How cool is that? Every ounce counts, and Harper is gaining 1/2 ounce to 1 ounce a day! She is just a little miracle, and I can't wait to see how the Lord uses her. We are so blessed and so happy! To update you on Addison - she had her shunt placed this week. She has been doing pretty good, considering the seriousness of the surgery. She came off the ventilator a few days after surgery and is breathing good on her own. They are now just praying that there will not be any infection. They do have her back on NJ feeds, and Rachel said she is spitting up some. She was very swollen still from the surgery since last I heard from Rachel, but it was getting better. Her eyes remained stable, but she does have Stage 3 ROP with a little Plus disease in one eye, so she remains at risk for eye surgery. Please continue to pray for this sweet family. They have been through so much and have a long road ahead of them. The shunt surgery was a big step on the road home, though. The shunt is permanent and will require additional surgeries as she grows and will always be at risk for infection or failure. Milly is doing really good! She is over 11 pounds now! We will get to see them on Halloween when both girls have a doctor appointment at the same office. I can't wait to see them. I made such sweet, life-long friends in the NICU. I am so thankful for Rachel and Jenny and that our girls will all have each other. We have big things happening this month so I will try to update more often. Until then, thank you for your continued love and support! So we are back in the hospital, but hope to go home tomorrow. She started having a lot of apnea episodes night before last so her pediatrician wanted to play it safe and admit her. We think it's reflux, but aren't sure yet. Her caffeine levels are very high so we are stopping that dose for now and she has started on meds for reflux. I'll update when I can but your prayers are greatly appreciated. Yesterday was Harper's due date! We took her to the pediatrician yesterday and she weighs 5 pounds 4.5 ounces. She is gaining slowly,but at least she is gaining. He wants us to slowly try to inrease her feeds. I can hardly believe she is 3 1/2 months old on her due date! We are so blessed to have her home and doing so well. Since she has been on the caffeine she hasn't had any more apnea events, praise God! She always recovered quickly, but it is so scary when your baby stops breathing! On Sunday we had a "newborn" photo session. She is actually 3 1/2 months old, but since it wasn't possible to do professional photos yet we are just now doing them. Nancy Hellsten came out to our house. It wasn't easy, Harper likes to be held most of the time, so we would get her good and asleep and then set her in a pose and she would wake up, fuss, and usually pee or poop! Luckily, Nancy is very patient! But we did get some good shots. I haven't seen them all yet, but Nancy got two of them up already on her blog . I will let you know when she has more up, but for now you can see them at http://www.nancyhellsten.com/blog/2011/08/08/Little-Miss-Harper-Grace.aspx I am so excited about these photos. We just love Nancy, too. She did our wedding pictures and then volunteered to capture the boys birth and our special time with them. We have her work plastered all over our walls! I am going to have to start taking older photos down in order to make room for new stuff. I have a hard time taking photos down, I always fall in love with pictures, especially those of Billie and now of Harper! Matt went back to work yesterday. It was hard for him to be away all day,but it went good. He met us on his lunch break to go to the pediatrician. Today Harper goes to the eye doctor. I am confident that her eyes are still going to be stable, but we aren't out of the woods yet, so please pray for her eyes. Only one more week and we should be in the clear! So blessed we may not have to do eye surgery! God is do good, all of the time! I realize I had some lessons to learn through not only all of this, but through pretty much the last 10 years of my life. They were hard lessons to learn, too. God kept trying to tell me to let go and let him be God, but I am such a controller and worrier I just couldn't do that for more than a few days. But seeing your baby so tiny and frail and vulnerable, being kept alive on machines, brings you to your knees. I have been to my knees before; When Michael was diagnosed with cancer, when the doctors said there was nothing else they could for him, when we were told we were pregnant with conjoined twins, when we were told they could not be separated, when Joshua and Caleb took their last labored breath in my arms. But this was different. Everyone always tells me I am so strong, but I think I am completely opposite. I am so weak. I go to God with my troubles and instead of turning them over to Him, I try to tell Him how to handle them. Not this time. I knew we had a long road ahead of us when I saw Harper for this first time, but God gave me this amazing peace that she was going to be OK. I have been told by so many "God doesn't put more on you than you can handle" and it used to make me mad. I would think,"Easy for you to say, you aren't walking in my shoes." What the saying should be is "God won't put anything on you that HE can't handle!" God told me that day when I first laid my eyes on Harper Grace, "Be still and know that I am God." And I was. I knew God had this, and there was nothing I could do. I am sure He has said that to me over and over again for the past 10 years, but I was not willing to listen before. I told Matt with such conviction that Harper would make it, he believed me, too. The doctor told him she had a 50/50 chance, but I was so sure she would be OK we both just put our trust in God and started the ride on the roller coaster of the NICU. And here we are today, the day after my due date with a beautiful baby girl keeping us up at night! I don't mind at all! We will see if I still feel that way in 6 months if she still isn't sleeping. I feel so blessed to have two amazing daughters. God has always been so faithful. When I am weakest, He is strongest. That got me through when I had the boys, and prepared me for our journey with Harper Grace. His Grace is sufficient for me. I held onto that and God continuously reminded me of that and then showed me how true it is. I have a miracle sitting in my arms this morning. Thanks be to God. He is good all of the time. How sweet are these two girls?! Billie loves to hold her sister first thing in the morning. I look at the two of them together and just thank God for blessing my family so much. I am so glad Billie and Harper will always have each other. God is GOOD, All of the time! Bright eyes...for those of you who knew me as a baby, can you see the resemblance? I think it is amazing to look into her eyes, and see my own looking back at me! Leatha, Joe, and I on our way to our 20th High School Reunion. I still can't believe it has been 20 years! It definitely doesn't feel like it. Matt stayed home with the girls and sent me this picture just a few minutes after we left. He was so sweet to stay and take good care of them, and to update me through out the night with pictures of them, too. 20 years...it doesn't seem possible but here we are, anyway! It was so fun to see so many sweet and wonderful people from high school. We only had about 70 people, but it was still wonderful. I think it is sad that more people didn't show up, but it was so good to see those that did. Joe and Leatha came in for it and they picked me up and drove me. I was so thankful to have them there, it would have been hard to go in by myself if they hadn't been there. Matt had to stay home with Billie and Harper. Since she is still so little and she bradys so much, we don't want to leave here with anyone else just yet. Until you are used to her brady or apnea episodes, it is very scary...well, it is scary even when you are used to them, but if you aren't used to them you are apt to panic and not handle them well. She does usually recover on her own, that is one of the good things about the monitor...since it is so loud, it stimulates her and helps her recover, but still we don't want to put anyone else in a bad situation. Don't misunderstand me, the monitor is not designed to stimulate her or help her in any way. It is just a tool for us to know if something is not right. I am so thankful for that monitor. It gives me the peace of mind to be able to close my eyes and go to sleep. I know if she stops breathing the monitor will wake me up. The monitor is cumbersome and awkward, but so reassuring. So back to the reunion, Matt was so sweet to send me pictures and updates during the evening. I was able to relax and just have a good time, I didn't even feel guilty for being gone! I am so thankful Matt is so good with her and is always so willing to be with her and care for her. And I am so thankful for Joe and Leatha. I still would have gone if they had been unable to make it, but it would have been much harder to walk in by myself! I was able to visit with them which is always fun. There was a table there with nostalgic items from high school and they had our "Senior Predictions" on them. They got half of mine right - "Marry Michael Williams, and replace Edie Ellis on the news." I remember being mad at Darwin Williams for writing that because I was hurt that it was all about Michael and not about me! But I guess he wasn't very far off so I owe him an apology after all these years, ha! It was a very good night spent with very good friends and I am so thankful for the experience. Tomorrow we are having our photographer, Nancy Hellsten, out to our home to take newborn pictures of Harper. I know she isn't newborn, but she looks it! I am very excited to get beautiful and artistic photos of Harper and of Harper and Billie together. Nancy was there with us when the boys were born and she is responsible for the beautiful photos of Joshua and Caleb that we treasure. Nancy was also our wedding photographer and we absolutely love her work. We are so comfortable with her, and I am so thankful to count her as a dear friend. I know we will be getting amazing shots of our two beautiful girls. Harper is doing very good. She was having a lot of apnea episodes, as many as 10 a day, but Dr. Greg put her on caffeine and she is doing so so much better. She actually hasn't had any more apnea episodes since she started on the caffeine. She still bradys some, but only when she eats. This week she gets her eyes checked again, and then weight checks at the pediatrician's office. Next week she will do both of those again, and also visit the apnea/synagis clinic. They take care of the heart monitor/apnea episode stuff and also the RSV immunizations. I think she will have her first RSV shot next week, although I am not sure. She will have one a month during RSV season which runs from August through April. We have to protect her from RSV, with her lungs being so premature and damaged from the vent, it would be a disaster if she got RSV. She would for sure end up on the vent again, but she might not even survive an RSV infection. This is one of the reasons we have to keep her so isolated. Any respiratory illness would be a night mare for her this year, and maybe even next year. We are just praying we are able to keep her healthy and give her a chance to grow and also build up her immunity. It is hard for us to not show her off to the world - we have been through so much and we just want to share her with all of our friends and family, but her health and safety comes first. Dr. Greg says if we can just get her over 7 lbs it will change our life, so our goal is to get her over 7 pounds as soon as possible. We will still have to keep her pretty isolated, but she will be able to keep her temperature up better, eat better, sleep better, and just be stronger in general. I can't wait until everyone I love can see her and hold her, but until then I will share her with you through pictures! Doesn't she look tiny in her crib?! She actually slept here for over an hour while I folded and put away her laundry. First bath at home...she loved it! Billie loves to hold Harper. She usually holds her first thing in the morning and last thing in the evening before bed. Very sweet. This was from the day we brought her home...Billie was just so in love at first sight! Finally...5 pounds 1 ounce on Friday! We take her back to see Dr. Greg Wednesday, and I am hoping she will be even bigger. We need her to get above 7 pounds and then we can relax just a little bit. We took her to get her eyes checked yesterday and they are still stable. The doctor said that if we can keep them stable through the next two weeks he thinks we will be in the clear and not need surgery, but we are still not out of the woods just yet. I have no doubt that her eyes are going to be just fine, though. She still isn't sleeping good unless we are holding her, but she is sleeping on her own for larger stretches now. I don't mind holding her...I had to wait so long to hold her after she was born, so it is just fine with me that she wants to cuddle. We are taking shifts, Matt taking the first shift of the night while I sleep and then I get up around 2 and take the second shift. We each get around 5 hours, and sometimes take a nap during the day, too. It is working out just fine. I will update again when I have more time...Harper is hungry! This peace lily sits in the nursery and has sat in there since we had the boys. It was a gift at their funeral, we have several others around the house. None of them have bloomed for years, three years to be exact. This one bloomed today. When I noticed it I had chills cover my whole body, and then I felt peace. I felt Joshua and Caleb smiling down on our family. I know that is cheesy and corny and I don't care, it is what I felt. How ironic that it would bloom when we finally brought a baby home to their nursery. It is really miraculous that the plant is alive at all... I am terrible with house plants. Matt actually remembers to care for them better than I do. But peace lilies are not hard to keep around, they are very forgiving and they almost ask you to water them when you do forget. I guess that is why it has never bloomed for us. And it is probably not a coincidence that Cathie was here for three weeks to take care of the plants (and everything else) after I had Harper. I am sure that has something to do with the plant blooming this week. But none of that matters. What matters is the way it made me feel when I saw the bloom. What matters is how I instantly was reminded of my boys in heaven. And I wasn't sad at that moment. I felt peace. I felt love. I felt warm. I felt peace. Peace is a beautiful feeling. You have to let go of pain and suffering in order to feel peace. You have to stop being angry and hurt to feel peace. Peace is a gift from God that is always right there, but we have to let go in order to feel it. We used to sing in VBS "I've got the peace that passes understanding, down in my heart. Where? Down in my heart. Where... Down in my heart to stay!" And I have felt that peace before. I never understood that song when I was a child, and I always asked my mom and my grandpa what it meant. They tried to explain it and I just couldn't understand, no matter how many times they explained it. The thing with peace is that you have to be still and quiet and let God BE. Just let God BE. And for a control freak like me, that is so hard. But He has been trying to teach me how to do that for years now, and I have gotten it before - like the "light bulb" came on. But then I would lose it with fear, doubt, guilt, and worry. I have a hard time just letting God Be. With Harper I have had no choice. There was nothing I could do to help her from the very beginning. But God gave us Children's Hospital, and the staff, doctors, nurses there, plus all of my doctors and nurses that cared for me and performed the delivery and surgeries. And He gave me the lesson of letting go and letting God Be. And even better, I learned it. Now I am not saying I won't forget and pick it all back up, but for now I am letting God give me the gift of peace. And that peace lily made me realize it. I am so thankful to have Harper home and for us to all be together. I love seeing Billie with Harper. She is so sweet and so happy to be with her sister. It is so beautiful. I am so amazed with how she looks at Harper; the love you can see in her eyes for her sister. That is also a gift from God. God has blessed me beyond my prayers, and I am so thankful. Harper is settling in and doing good. She went to her pediatrician today and she didn't gain or lose weight...she is still 4 lbs 14 oz. We will take her back Friday to get her weight checked again. She gets her eyes checked tomorrow. She is eating good and sleeping good and just getting used to us and home. We are all enjoying her so much. It is so nice to hear her sweet grunts - she grunts a lot! I love all the sweet noises she makes, even her cry. She is easily consoled, too. It feels so good to be able to fix what ever is the matter for her. She doesn't cry much, though, at all! She is such a good baby. It is hard for us to put her down to sleep, we want to cuddle with her so much, but we want her to grow and she needs to sleep sound to grow. Update on Milly...she is home. Jenny said she did good her first night. She only woke up twice to eat and then went right back to sleep. They are waiting for results from a culture on fluid from her incision. Prayers are needed that it is not infection. Milly will have a lot of follow-up visits, but praise God she is home! Addison is doing good. It was so sad to be leaving her and her sweet parents at the NICU while Harper and Milly both got to go home. But Addison is quite a bit younger and she will get her day! She has started to nurse a little which is exciting. They are working on getting her to gain weight. She still has the brain bleed and prayers are still needed for that to resolve. She also has stage 1 ROP. She will have an eye check tomorrow and I will pass on the news. Addie and her parents need a break. They have had to deal with way too much. It's time for some smooth sailing for that sweet family! Thank you for your love and prayers! We love and appreciate you so much! This was after we laid her down for a nap...Billie pulled a chair over to her bedside and Matt and Blue joined her. I am afraid she isn't going to get any attention! Billie and Harper together at last! This is the FIRST time Billie ever touched Harper or even got to see her without glass separating them!It was a beautiful moment. Billie is so in love with her sister. Billie sat down and read her a book first thing, and Harper just watched Billie. My heart is so filled up it might burst! This was at 3am. Harper didn't seem to like being in her cradle much. She kept grunting or even crying until we picked her up. We fed her a few times, but she didn't eat much and if I swaddled her, she went right to sleep and was happy as could be. Harper doesn't cry much, usually, but she grunts all of the time! So cute! Her first car ride! She loved it. Was very happy the whole way home. She fell asleep not long into it. For those who have not heard...things did change fast yesterday! Not long after I blogged, I got a call from Kary (one of our primary nurses at the NICU.) She said they were giving us the choice to room in or not, and if we were OK not rooming in, then we could go home TODAY! So I called Matt who had actually gone to Johnson City to play golf for his 20th High School Reunion. He and I both felt confident with our abilities to take care of her without rooming in first, so we opted to bring her home yesterday! Billie was actually in Johnson City with her grandparents and cousin Chandler playing on the lake, so Matt swung by there and picked her up. She was so excited! We left the hospital around 6 pm. Billie held her first when we got her home. I have a video of it that I will post later. Harper got hungry not long after that, so I fed her and then put her down for a nap. Billie pulled a chair up to the pac 'n play and just watched her sister sleep. It was just precious. Then later we were eating dinner together, and she said "I feel like this is all a dream and I am going to wake up and none of it will be true." She also read her sister a book - which she said she had been waiting to do forever. She already had a book picked out that she wanted to read to her - "Angelina Ballerina." As Billie read, I fed Harper a bottle and Harper kept her eyes locked on Billie the whole time. It was so sweet. They are going to be so close. I am so thankful to God for this amazingly perfect day! My family is all here together under one roof and it was beautiful! And we get to do it all over again today! It was bitter sweet leaving our family at the NICU. We had two primaries there to send us off, Betty and Kary. I cried as soon as we started the walk out of the NICU - it dawned on me that I would never be in that room again after spending 3 straight months there! As much as I wanted to be home with Harper, I fell in love with so many people there. As we made our turn away from our little corner and towards the door leading out, we could see down the long side of the NICU and all of the nurses looked up and waved at us and said "Good Bye!" It just warmed my heart and broke it all at the same time. When we got to the car, Matt and I didn't have the car seat in right, of course! The same thing happened when I took Billie home, LOL! But Kary helped us get it right. Then we hugged and said our good byes and then we were off! I will never be able to thank all of the people that had a part in Harper's miraculous recovery. God was in control, and He put them in Harper's life to care for her and help her get to this point. I will miss them so much, and I am sure Harper will, too. We will go back for visits, but it will not be the same. I just can't put it into words the love I have for them and the gratitude I feel for them. Praise God, He is good! And we are healthy, happy and HOME! This was taken yesterday just after breakfast...she has learned to love her meals! One of the nurse practitioners, Kathy, said the day before if we don't remove the NG tube, we will just keep using it and she was so right! We took it out and since then Harper has been eating all of her meals with no problem. And it is because of this that they think we may go home early next week! We don't have discharge orders yet, but we are so close I can taste it! Her eyes were still stable on Tuesday, and she will have them checked again this Tuesday. We have to room-in with her, which is where we stay there in a room at the hospital with her over night and take care of her all by ourselves. She needs to not lose weight that night in order to be discharged. She also has complete a car seat challenge, where she has to sit in the car seat for 90 minutes without dropping her heart rate. I can't believe we are this close finally! Milly is getting ready to go home, too. They are rooming in tonight and the plan is to discharge tomorrow! I am so happy for them. I actually got to hold sweet Milly yesterday. She is only 2 pounds bigger than Harper, but she felt so much bigger! She is so sweet and cute. It is amazing how different Milly and Harper look from each other, but they are both just a precious and cute as the other! Addison is doing good, too. She is struggling to gain weight right now so they are working on that. They had to do another ventricular tap, and that set her back for a few days. It helps her, of course, but it also makes her feel very bad. My prayer for her is that the bleed starts resolving on it's own and she starts to gain weight again. It is going to be bitter sweet leaving the NICU. We long to be home so bad...have both Billie and Harper under the same roof and just be a family together again. But we have also fallen in love with the nurses and staff at Children's. They are the most caring and brilliant people you will ever encounter in your life. I hope no one ever has to be there, but once you are there you are changed for life. Thank God we have such a wonderful hospital for our children right here in Knoxville. We owe our miracle Harper to them, and will never be able to repay them. But they do the same for everyone because they care about children so much. We weren't special, although the made us feel that way. They treat every child with the same love and care that they showed to Harper Grace. Thank you so much to everyone at Children's, although I know thank you will never be enough. There really are no words to adequately express our gratitude to you all. We fell in love with all of you! I will try to keep you updated, but know things change quickly and I have a lot to do to get ready at home for Harper! Thank you all for your love and prayers, I know they are also a big reason for Harper's amazing progress, too! Happy 3rd Birthday Joshua and Caleb! Harper looking at her Mommy! I apologize for this post being so late. I actually wrote a update yesterday via my phone 3 times, but something was wrong with the app and it kept getting lost. Very frustrating. But good news, her ROP is stable! We are so excited. I don't even think she will need surgery now, but we will still wait and check her eyes again next week. There is a slight chance she will still need it, but it gets less and less with each week that her eyes don't get worse. We are so happy. Now the only thing standing between us and bringing her home is her ability to eat all of her meals herself without the need for NG tube feeding assistance. We are working on it. She is learning every day and improving every day. She is just so young and so little, she still shouldn't be born for another 4 weeks! She weighs 4 lbs 10.5 oz, and is 36 weeks (or 11 weeks old). Actually, this is the week they would have done a amniocentesis to see if her lungs were developed and if they were they would have delivered this week via c-section. The doctors were concerned if I went into labor that I might have a uterine rupture...guess they were right in being concerned they just didn't know it would happen at 24 weeks. God had His own plans! Milly is doing very good. She is off the vent and is feeding now. Jenny (her mom) and I think they may get discharged around the same time. Addison is doing good, too. She had a ventricular tap this morning and Rachel said it went good. We will see if it makes her feel better today. My prayer is that her parents will see big improvements and her bleed will resolve now, without the need for another tap or a shunt. I read something on a friends Facebook status that I haven't been able to get off my mind, especially this week. She recently lost one of her 6 month old triplet boys, Owen. In my memory, it repeats like this, though: "God, I was planning on holding my boys in my lap and teaching them about you. Will you hold them on your lap and teach them about us?" Friday is Joshua and Caleb's third birthday. I can't believe it has been three years since I kissed their sweet heads and cradled them in my arms. I wonder what they look like, what toys they like to play with, what they like to eat. Of course I still wonder if they are conjoined or separated in heaven. What we have been through in just three years! I can't let myself think about that, now, though. My daughters need me to be strong. I have two miraculous daughters and I am blessed beyond measure. I still miss my sweet miracle twin boys, though. Nothing can replace them, and nothing will make me stop missing them. Even though now I am busy with a 10year old and a preemie! So on Friday I will allow myself to miss them wholeheartedly, to wallow in my heart ache a little. And then on Saturday I will go back to concentrating on my wonderful and miraculous daughters. TWO DAUGHTERS - blessings beyond my wildest dreams. Harper had an echo on her heart last week. Her PDA is totally closed! They found a murmur and it is called ASD and is a small hole that is not causing her trouble now but if it does can be corrected with surgery. She also has a PFO, which is very common and shouldn't cause her any problems. I will update in more detail on these two heart defects later but for now she will just see a cardiologist every 6 months. Her eye exam is tomorrow so we are prayerful and hopeful we will see some regression. She is improving on her bottle and breastfeeding, too. It is a lot of work for one so little, but she is learning and doing better every day! I will update again tomorrow after her eye exam. Thanks and love to all! Today was a big day for all of us! Harper had her first bottle today. She did pretty good; they give them a score of 1 to 3 and she only got a 1, but she tried really hard! Matt gave her the first bottle. I am still nursing her three times a day, so I also fed her three times today and after she nursed, I tried the bottle, too. So needless to say, she was worn out and lost a little weight today. It will take time, but she will get it. We were told yesterday that once she does good at eating and if her eyes are OK on Tuesday, we can bring her home! Isn't that amazing? I couldn't even believe it, still can't! It could be as early as this time next week! We are a little scared, but mostly just over joyed! Harper did have several brady episodes today while eating, so she will have to really improve her feeding before she is discharged. I spent about 9 hours there today, I just couldn't bring myself to leave. But I am paying for it now because I am exhausted. Baby Addison came off her vent today, and went straight to a cannula! We are so excited for her! Baby "m", who is actually baby Milly (her parents, Jenny and Teddy gave me permission to put her name here) is doing good. She is still on a vent and they will be doing a procedure tomorrow to be able to give her nutrition support and then hopefully she will be off the vent sometime tomorrow. I will keep you updated as soon as I can! Thank you for your continued prayers! Great news on Harper's ROP... No change from last week. So while it didn't regress as we were hoping, it didn't progress further, either! The doctor said we will just check them again next Tuesday. More waiting, but that's ok! Waiting is much better than sending her into surgery. Baby "M" did great for her surgery. She was resting when I left. And they moved her right next to Harper so our friends are our neighbors now! Very nice. Now we just have to get Addison moved to our corner and we will be all set! I promise to try to remember to ask Baby "M's" parents if it is ok to put names on the blog, I just forget until I am leaving the hospital or blogging! Nursing isn't going so good. I have plenty of milk, Harper just doesn't get much when we nurse. So we are going to try a bottle on Thursday. I hate to, but if she doesn't eat she can't come home and that is mostly what is keeping her there now. I'm not giving up, though. I will still try to breastfeed her at each sitting and then supplement with the bottle. And she will still get breast milk even in the bottle. If I have to pump forever I will, but that is not what I want. I think once she gets bigger and stronger it will get easier for her to nurse. Besides, I have a whole deep freezer full of milk, we might as well use it! Thank you again for your prayers, but don't stop now! We still need prayers for Harper's precious eyes and prayers for nursing. It does make me sad that nursing isn't going well and it is a source of stress for me. Today is a big day for Harper and for us...she has her eyes checked again to see if the ROP has progressed, regressed, or stayed the same. Our prayer is that God continues to hold Harper in His care. That what unfolds today is part of His plan. We also pray that He hold the doctor in His care and that what the doctor decides about Harper and her eyes is what is best for Harper and God's will for Harper. The doctor should come around lunch time and I will let you know as soon as I can. Please also keep Baby "M" in your prayers today as she has surgery, as well as her sweet parents as they wait for her. Thank you for always being willing to love us and pray for us. Harper is ready for the Fourth of July! Her crib is all decked out with red, white and blue blankets and she has on a cute outfit and a pretty blue bow in her hair! All thanks to Kary, Jennifer, and Ashleigh (and Daddy who dressed her tonight). She is doing so good. She weighs 4 lbs 1.4 oz! Woohoo....4 pounds! I can hardly believe it, but I am so thankful to God for it! Her feedings have been increased to 40 mL, and she is improving with her nursing, which we do 3 times day. She is getting some milk every time, although sometimes it is only 2 mL. She does brady sometimes still, but not every time so that is getting better, too. She is doing good keeping her temp up on her own, so as soon as they have a regular crib for her she will graduate out of the isolette. They expect to have one tomorrow after a baby is discharged. Tuesday is still a big day for her with her eye exam happening. We are praying for regression, but will try to be prepared for what ever happens. Also on Tuesday Baby "M" will be having her surgery, so please be in prayer for her that everything goes smoothly. Baby Addison is doing great tonight, too! Her vent levels were much lower today and it is so uplifting to see her keep having good days! Her sweet parents made Harper some bows for her hair and bought her a really cute shirt, too. I will put a pic up of Harper in it when she wears it. All three girls will have matching bows! We plan on taking a picture of the girls together every year around their birthdays (we will have to pick one day in the middle since they are all a few weeks apart) so we will need to have matching outfits for them every year! Can't wait for the first picture of the three of them together...wonder if we will get one in the NICU before the first one gets discharged. Maybe we need to take one now of the mommies together to post here...then we can look back years from now and be thankful we aren't so stressed out anymore, lol! Thank you, Rachel and Phillip for the bows and shirt! I hope everyone enjoys the 4th tomorrow, be safe and have fun! Harper is 10 weeks old today! Harper is growing and getting so big! She is 3 lbs 14.5 oz...almost 4 lbs!! I am sure she will be 4 lbs sometime over the holiday weekend! They are weening her out of the isolette and into a crib, so she will now have to regulate her own temperature so she could lose a little weight keeping up with that, we will just have to see what happens. This picture is so cute, isn't it? Matt had stayed late that night so he could give her a bath. Since she really needs her sleep to grow, we can only get her out and hold her or give her a bath if it is feeding time, and since I had nursed her at 8:30 that night, we couldn't give her a bath until her next feeding time at 11:30. So I brought Billie home and Matt stayed and gave her a bath...which she LOVED! He said she gave out a little cry when he first plopped her into the bath but then she realized she liked it and settle in and enjoyed it. She needed it...we hadn't given her a bath in a while, but her nurses had cleaned her up, of course. She is up to nursing 3 times a day now, which is hard with Billie but we are making it work. We are so blessed to have a very helpful and big family to make it go pretty smooth. The doctor actually mentioned the word "home" the other day...he took Harper off of her myceline and said it was "to get her ready to go home in a few weeks!" Music to my ears. We still have to get through her eye surgery, though, but I have been day dreaming of having my entire family under one roof! How awesome that will be! I can't believe we are actually going to use our baby nursery for a baby and not just for storage of baby things we don't really need. I have a lot to do to get the house ready for Harper, and we have lots of things we need to purchase for her like a monitor, and bottles. She came so early, I never had a chance to prepare for her! Since she went off the myceline, she has had a few more bradycardia episodes...but she brings herself up quickly. We will just see how it goes. The myeceline and caffeine are to help with apnea, and the only way to see if she is ready to come off of them is to try it. There is a chance she will come home on the meds, but they want to give her every chance possible to come off of them before she comes home. I must run...I nurse Harper at 8:30! Pray it goes good...it has been going better but she is still having brady episodes during feedings, and it still freaks me out, although not as much. I don't want to get used to them, though, I just want them to stop. Update on baby "M"...she is doing good...they are going to run a test this week to prepare her for the reversal of her colostomy and illeostomy which is great news! I will let you know when they schedule the surgery...she and her parents need your prayers. Baby Addison is still doing great after her heart surgery...and mom got to hold her last night! It was beautiful and I am so happy for them. She will really start growing and doing good now that her heart is fixed and her mommy gets to love on her more closely! I don't have time to proof read, so please forgive any errors!! Billie is in horse camp this week and enjoying every minute of it. She actually fell of a horse yesterday, but didn't get hurt. I told her before she went "No falling of your horse!" LOL! But since she fell and handled it so good, she gets to choose her horse today and can ride which ever one she wants! She was very excited about it, so much so I asked her if she fell on purpose so she could pick her horse! So today she will be riding CJ. She says she loves CJ because he is so cute and so sweet and he acts like a dog. I love his name since to me it stands for Caleb and Joshua, I thought very ironic. So today Matt took her to horse camp so he can see her with her horse. It should be fun for both of them. Since you were praying for her and her family, I think you deserve an update. I did get permission from "Baby A's" parents to talk about her here, so her name is Addison and her sweet parents are Rachel and Phillip. Addison was born at 25.2 weeks and just about 100 grams bigger than Harper and she is now about 4 weeks old. Her PDA (or "hole" in her heart) did not close with the medication they gave her the way Harper's did, so she had to have surgery to close it yesterday. She came through with flying colors and no complications. So now Addison should start really improving and they hopefully will be able to ween her off the vent soon. She is a precious little miracle just like Harper and we are so thankful for her strong, fighter spirit and for her special family and it's place in our lives. Harper is doing great. She is now nursing twice a day and yesterday morning she did great and didn't brady at all, the scale said she only got 2 mL, but that seems impossible because she was doing such a great job. Last night she did equally good and got 6 mL, but she did have a brady episode. She brought herself out of it quickly, though. Speaking of Harper, I need to leave and head to the hospital to nurse her now so I will update again soon. Thank you for your prayers, please continue to pray for Harper and specifically for her sweet eyes!